St. Fiaac's Church is situated overlooking the spectacular village of Clonegal and the picturesque valley of the Derry River. The present Church was built in 1819 on the site of a former Church and the graveyard around it has gravestones dating from 1777. The Church was built in the Gothic style with Tower and Belfry and under the supervision of Mr. John Bowden, Architect. 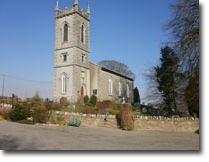 The parish embraces parts of Counties Wicklow, Wexford and Carlow. Three double stained glass windows depict the Good Samaritan, a scene from the Good Shepherd and the third window depicts the Resurrection scene. In July 1821 a meeting of parishioners of St. Fiaac's was held and it stated that the parishioners wished to subscribe to the building of a new Roman Catholic Church in the parish of Clonegal. On 22nd July 1945 the Consecration of the graveyard extension took place- made possible by the good will and generosity of Denis Doyle. In February 1989 an extension was added to the Church car park- made possible by the generosity of the Hickey family. A new turnstile was erected in 1989 by George Rothwell to give easier access to the Church grounds for the many visitors who call to view the church and ancient burial ground or to visit the graves of relatives who rest there. In 1992 a ramp was built leading from the new car park. In July 1993 the parishioners painted the interior and exterior of the Church. A new coping and path were laid from the middle gate to the steps leading to the main door and standard lamps were erected.